I’m now in Belgrade, but I feel I am starting to catch up with the blog. 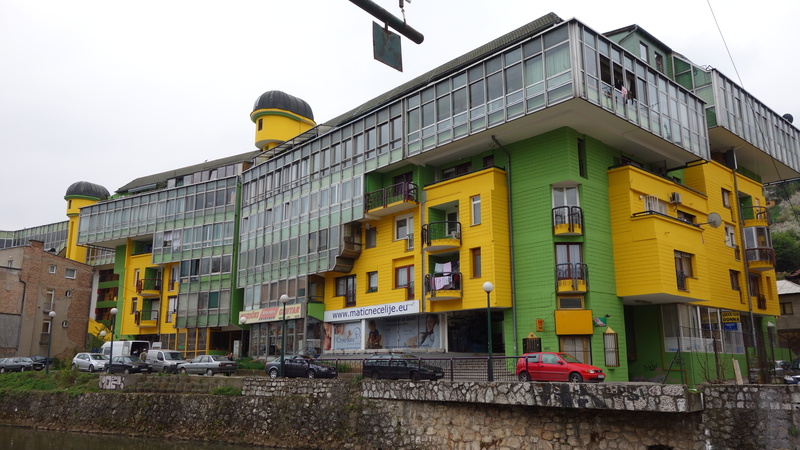 Bosnia was a beautiful country with some amazing food but its obviously still a place trying to come to terms with its recent history, here is my experience of it’s two most famous cities. Sarajevo. There’s something about the name. It instantly sounds exotic amongst the more Western sounding names most European cities have. There’s good reason for this, as it was founded and named by the Ottoman Turks when they controlled the region and much of the Balkans. As I walked to my hostel, (you won’t be surprised to know I got lost and walked in circles several times until I found it) dusk fell and the sounds of the muezzin’s issuing their calls to the faithful from the minarets that, lit up, dotted the skyline, I knew the curtain would soon be drawing the European part of my journey to a close. 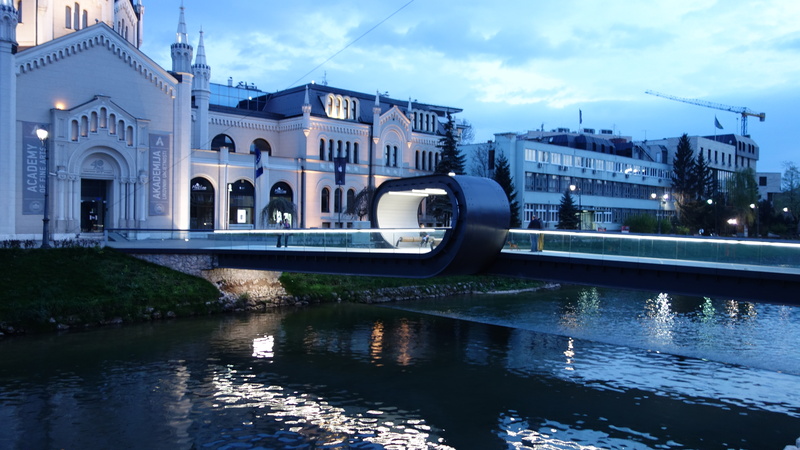 Sarajevo is a spectacular, yet unspectacular city. In terms of sights and architecture, enough remains of the old Ottoman and Austro-Hungarian parts of the town to give an insight into the strange mish-mash of cultures this place has been for much of its history, but communism and a brutal siege has not been kind on Sarajevo from an architectural point of view. 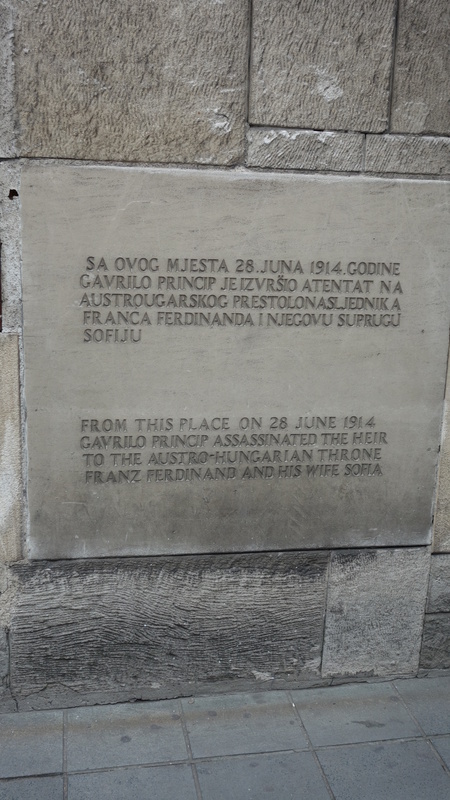 Arguable one of its most famous “sights” is not even a sight, but a concrete marker, singling out the spot from which a 19 year old Gavrillo Princip assassinated the heir to the Austro Hungarian Empire and his wife in 1914, finally providing the push needed to make the dominos of Europe’s great alliances collapse into war and the destruction not just of the fledgling German Empire but two of Europe’s oldest powers, the Hapsburgs of Austro-Hungary and the final collapse of the Ottomans who from Istanbul once exercised control all the way from Egypt and beyond to the gates of Vienna. It’s a very sobering city to wander around. It’s in a magical location, surrounded by high mountains, which somehow makes all the tragic recent history of this city all the more poignant. Scars from the war can be seen across the city, from plaques in memory of those killed, to shrapnel damage on the side of the cities Catholic Cathedral, to bombed out buildings remaining derelict whilst squabbles over ownership drag on and to most affectingly and yet almost unnoticeably, Sarajevo roses scattered amongst the city. 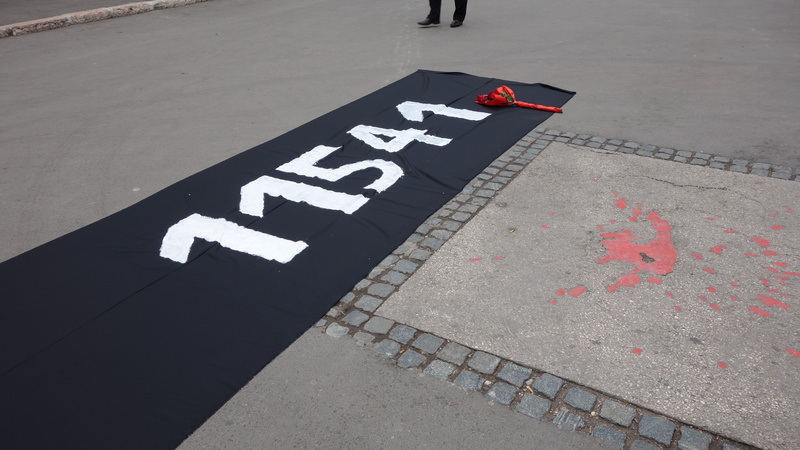 Under siege from the Serbian army during the Balkans war, Sarajevo was hit by many mortar shells and of course rather than leave a city permanently scared by potholes these have been filled in. Except often they have been filled in with a material with a soft red colour. 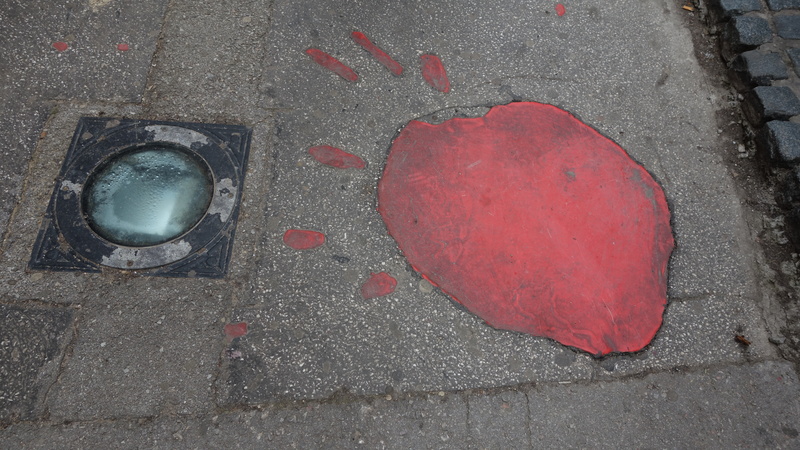 Every one of these marks the spot where a mortar shell killed a member of the besieged populace. A reminder locals and tourists alike now walk over everyday. 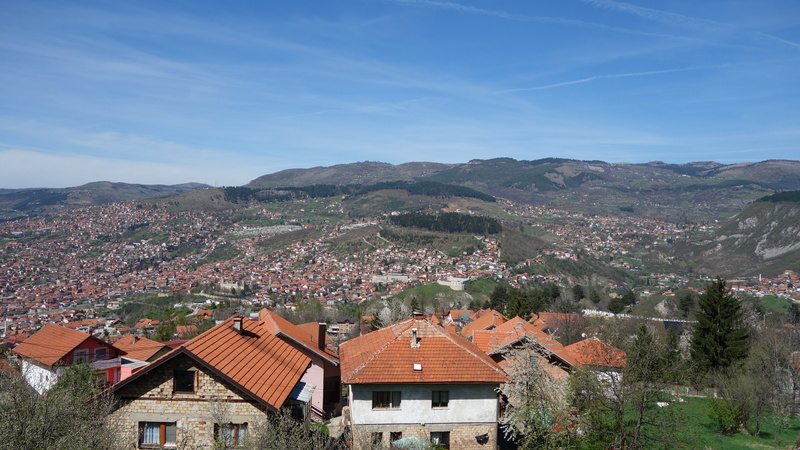 A hike up into the hills around Sarajevo is a good way to see some spectacular views of the city, although it should be noted that leaving paths or trekking without local guides is unwise for anyone not wanting to get close up and personal with remnants of the Bosnian war by stepping on a landmine. The trek I chose to do never went into such areas, instead following the residential streets of the city as they weave themselves increasingly higher up the hill sides till, a good hour after we set off, we arrived at a sad memory of all that once was, the bob-sleigh track from the Winter Olympics at Sarajevo in 1984. 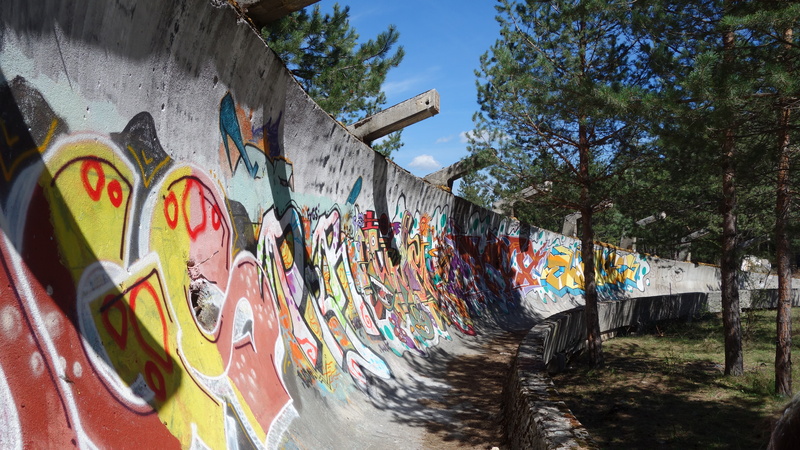 It’s a surreal experience walking up a bob-sleigh track, in bright sunshine, taking in all the graffiti that now covers it and thinking of all that the decade following those Games would bring the host city. 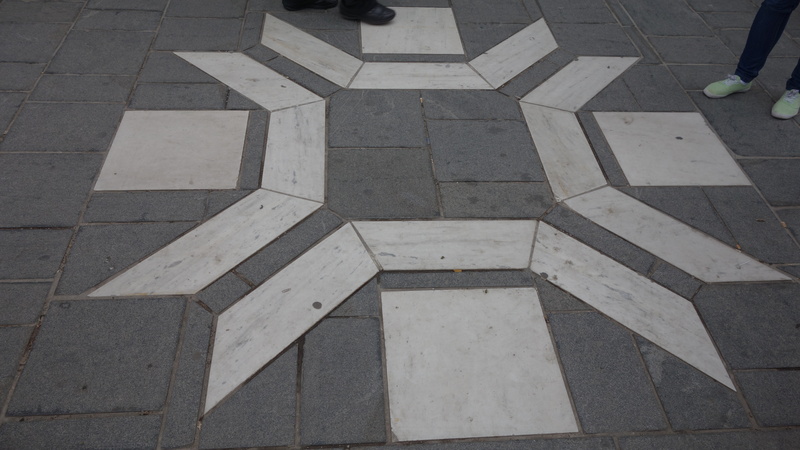 The logo from the ’84 games in paving stones in the city centre. 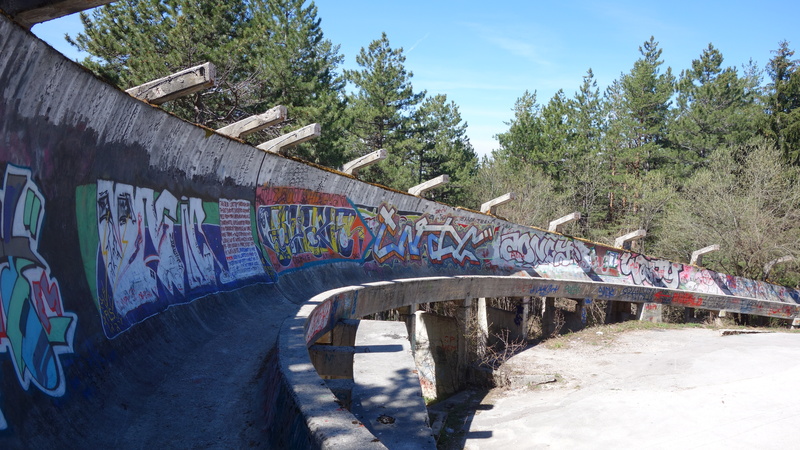 The bob-sleigh track now a canvas for artists. 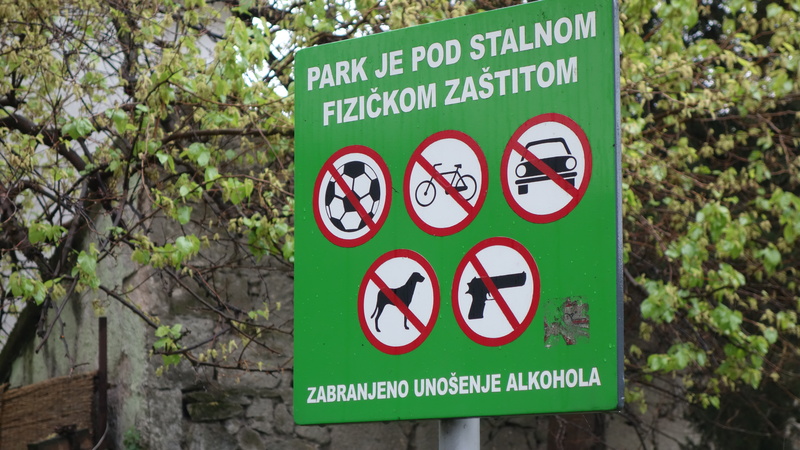 But Sarajevo is of course trying now to move on, and there are small signs of increasing tourism. One thing they definitely have on their side is the food. The Bosnian specialities we had following our decent from the bob-sleigh track is probably the nicest food I have had on any travels. Asking around the locals for their best recommendations on what restaurants to try and what dishes to sample is highly recommended. 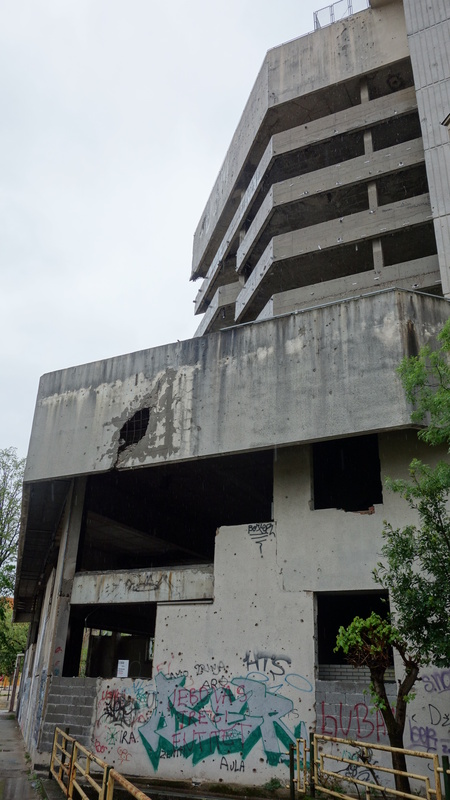 After Sarajevo I headed to another town scared by the conflict in Bosnia, Mostar. Today it is famous, as it was before the war, for its beautiful bridge, the Stari Most, high above the river below, surrounded by the Ottoman old town. For many tourists its all they come to see, and indeed the local tourist information mentions nothing outside of the bridge and its old town. 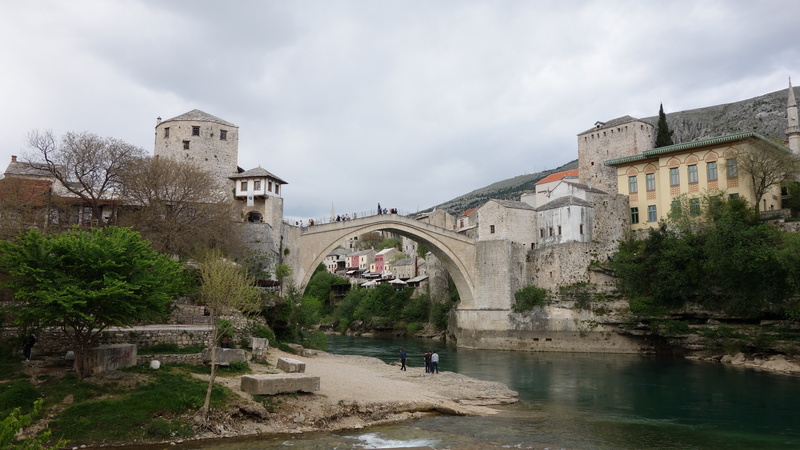 But of course the bridge and the old town had to be largely reconstructed after the siege of Mostar, where Croat bombardment destroyed many buildings and famously, the bridge itself. The bridge, reconstructed or not, is spectacular, and having uploaded some photos to my personal Facebook account it seems my friends agree. 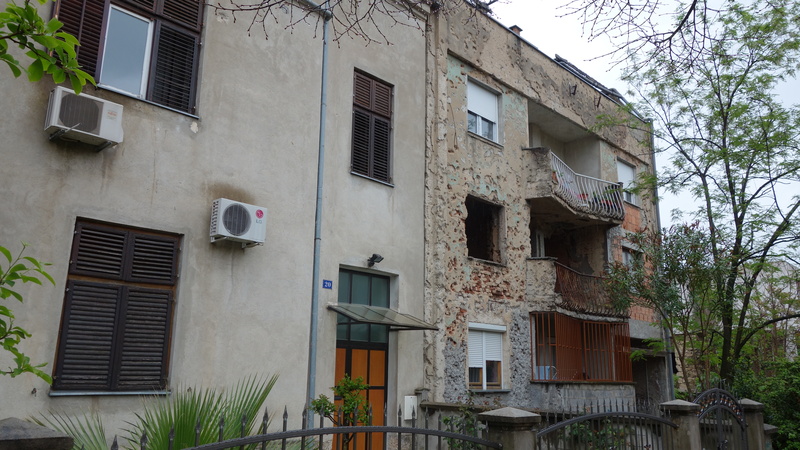 But the scars in Mostar are not hard to find, and talking to its populace its clear it will be some generations before anything like closure will truly be achieved. 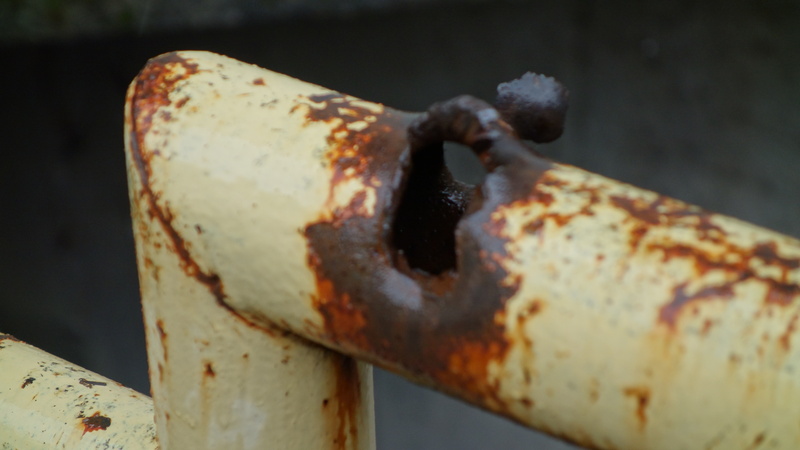 The owner of the hostel I stayed at was clear in his disgust at the lack of help from the local government for those who suffered in the war. The weather, as he drove us around to show how real these scars still are was appalling, with cold driving rain, which somehow matched perfectly with my early memories of news reports from the Balkans during the 90’s. For some reason I can’t remember any in which the weather looked anything but awful. 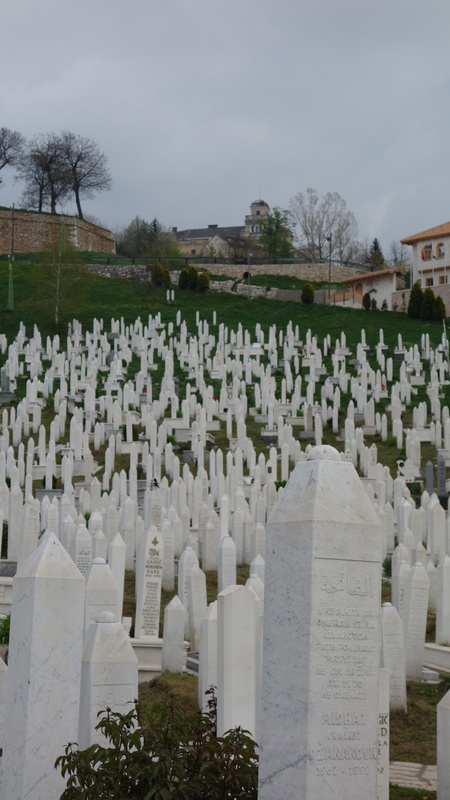 The Bosnian front lines, against the Serbians on the one side, and their erstwhile allies, the Croats on the other, must have been a hellishly bleak place, especially with the weather like it was. 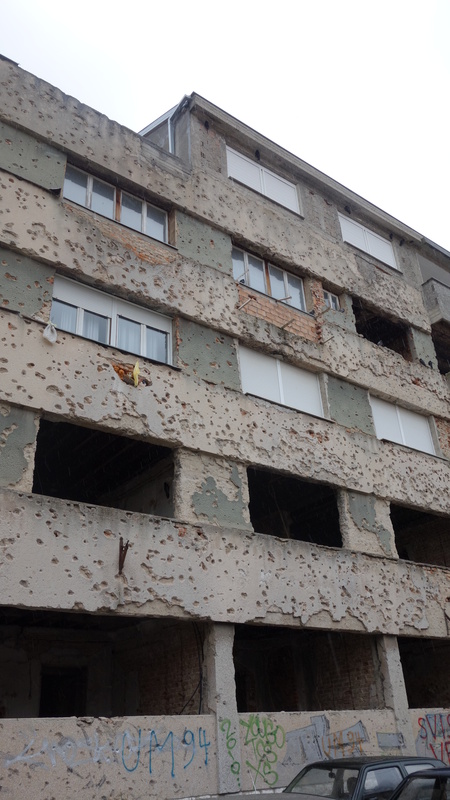 The old car park used as a sniper position by Croat forces still dominates much of the skyline on Mostar’s west bank, but more affecting was seeing the damage to houses, where, with little state effort to help repair and rebuild, families with no where else to go have instead taken matters into their own hands, leading to truly bizarre situations where by one 3 story block of flats, had the ground and top floors roughly repaired and families back living in them, whilst the middle floor remained an abandoned bombed out shell. No one is going to move on quickly living in such a place, or walking to school or work past such places. 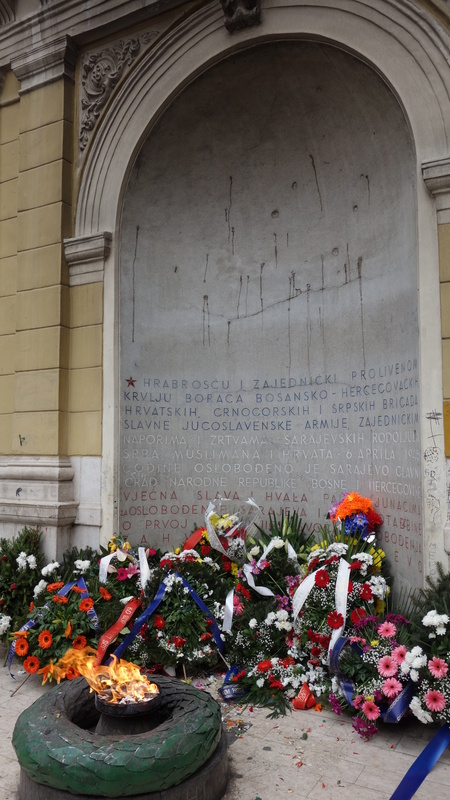 Even today the extremists attack memorials to the conflict. 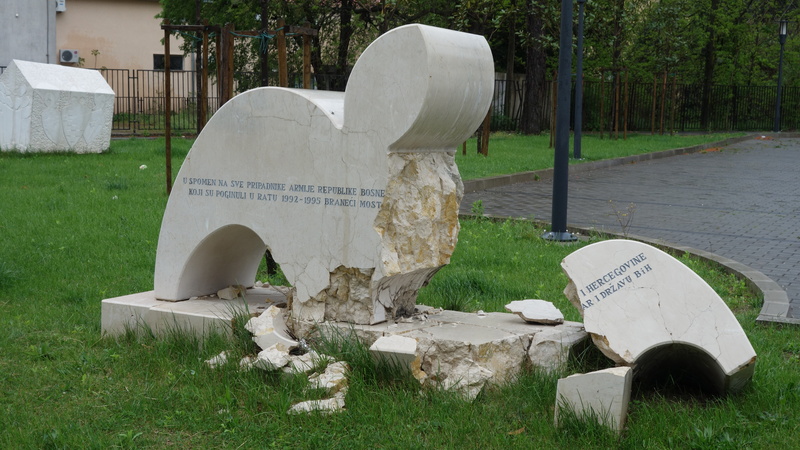 A sign of hope though, and perhaps the last thing you would expect to see in a park in Bosnia, (or indeed any park) is that the town and its people have at least managed to chose a hero worthy of a statue in their town that would not be interpreted as political by either side. 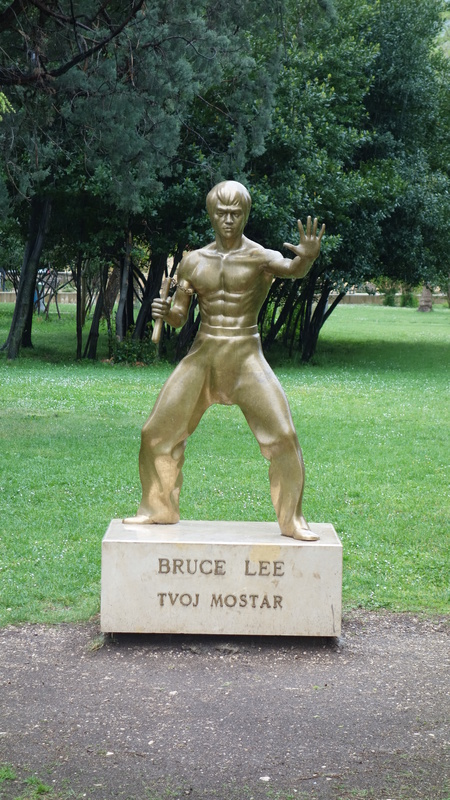 In Mostar’s main park therefore, there stands a statue of none other than Bruce Lee. Was not expecting to see him here…. Miran, the hostel owner explained, “his films are never political, he simply always fights for good against evil.” The inscription he explained, simply reads “Bruce Lee, you are Mostar.” Like Bruce Lee, one hopes Mostar will eventually defeat the evil scars of its past.